Floral Sheeting made in a different way, some people prefer the look of 'finger' sheeting rather than 'rosettes'. Use it to cover large areas such as the deck and sides of a float. It's rain-proof, flame-retardant and easy to apply - just staple it to your float. 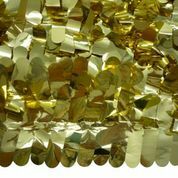 Available in six metallic colors, rolls are 3' wide x 30' long.